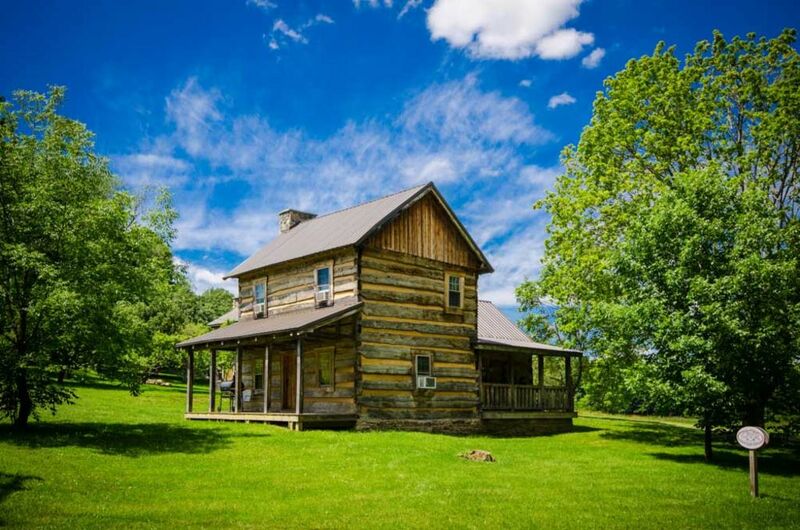 The Orndorff Cabin sits on one of the most scenic areas in the Laurel Highlands! Hike to the top of the drive and overlook the most spectacular views of Sugarloaf Mountain! This cabin is just two minutes from Ohiopyle State Park which offers Hiking, Biking, Rock Climbing, Whitewater Rafting and Kayaking. Relax and enjoy your stay at this completely renovated two bedroom and one bath log cabin. The Orndorff Cabin sleeps 6 and is fully furnished. The cabin is accentuated with solid wooden floors, vaulted wooden ceilings and rooms filled with light. The Orndorff Cabin is perfect for those who love the feeling of a cozy, warm getaway with all the conveniences of home. This unit also includes High Speed Internet with WIFI throughout the house. After a long day of fun in the action packed Laurel Highlands come home to relax in the wooden rocking chairs on the outdoor deck or test your outdoor cooking skills on our BBQ grill and smoker. The Orndorff Cabin is conveniently located next to The Schaefer House which sleeps 8. Rent both homes for your large group or just the Orndorff for a smaller getaway! With its beautiful surroundings and convenient location, the Orndorff Cabin will be a vacation that will hold a dear place in your heart for years to come. High Speed Internet and Cable TV! ***PET / SPECIAL EVENT RULES*** Our home is pet friendly, however there is a $50 fee per dog staying in the home. Please let us know ahead of time if there will be dogs staying during the reservation. Orndorff Cabin amenities include: A fully equipped kitchen - full size stove, air conditioning, refrigerator, microwave, toaster, coffee maker, pots, pans, dishes, utensils, blow dryer, vaccuum, iron, ironing board and all towels and bed linens. Sleeper sofa in living room. The Orndorff Cabin is located next door to The Schaefer House which sleeps 8. Perfect for large or small groups. Consider Ohiopyle Vacation Rentals for your next visit to The Laurel Highlands area! This property is as pictured, and it&#x2019;s adorable. Sheets, towels, kitchen and bathroom were clean. It had obviously not been rented in a while, though, and the cleaning staff didn&#x2019;t do a full cleaning before we came in. There were a lot of dead bugs around, and the window sills and stairs were dusty and dirty. Also, we saw mice in the house at night, so you may want to take care of that. The porch light was out above the door, which made getting in tricky at night. Great location to Ohiopyle and surrounding area. The property is great and the cabin offers a perfect getaway spot. The only downfall was the weak wifi. Wonderful rustic cabin with nature right outside! The cabin was clean, and sunny (lots of windows in the kitchen), with everything needed to have a great time! Location was great as well, just a few miles from hiking trails and other outdoor activities. Cabin was great, authentic rustic country cabin. Plenty of space for a family of 6. Nikki was very helpful with a request I had to extend the check out time for our trip. Pros- clean, location is only 5 minutes away from all the attractions, restaruants and a store nearby, comfy beds, fully equipped kitchen..every gadget you need, clean linens and towels, grill, air conditioners in every room, cable TV, all windows have blinds Cons- photos do not show the busy road that is right out front(I have a toddler & was nervous the entire time we went outside), the nice chairs shown for the porch were not present, wifi is sketchy, 1 roll of toilet paper for a family of 6 (bring your own), for the price -check in and out times are not great (4pm does not allow much time to enjoy the place before it gets dark and 10 am is rough), another cabin(not shown in photos)is right there so privacy is limited - cabin is not secluded as it's deplicted in the photos Overall I would book again. It was a great time -the place was beautiful & charming! The location was excellent. Did not like that we could not open windows due to all the air conditioners. Too many dead flies on windowsills upon arrival...sorry, but it was a turnoff. Also did not receive directions, code access to cabin until day of departure. This is our fourth stay at this cabin and it won't be our last. Hiking, biking, rock climbing, swimming and white-water rafting/kayaking and at Ohiopyle State Park just 5 minutes away! Whether your interests include golfing, skiing, white water rafting, hiking, biking, hunting, horseback riding, swimming, boating, antique hunting or sight seeing you are just minutes away from your destination! Also nearby for your convenience are restaurants, gas stations and grocery stores.